Thursday’s evening reception brought us to the former St. Alphonsus Church in the Irish Channel, a National Historic Landmark built 1855 to 1857 and featuring interior murals by Italian-born New Orleanian artist Dominique Canova and stained glass by F.X. Zettler of Munich, Germany, installed in 1890. At St. Alphonsus, we enjoyed good food and fellowship, but the wonderfully nerdy architecture trivia contest was unfortunately marred by a rigged outcome in which my team, clearly the smartest and most talented, had the prize stolen from our grasp at the last moment by the biased judges. Is there no justice in this world? Our keynote speaker on Friday evening was Keith Eggener of the University of Oregon who presented “What the White Queen Said: When Memorials Look Forward,” concentrating on the World War I Liberty Monument in Kansas City. Public memorials are a Hot Topic in our circles right now, especially in New Orleans, so there was a vigorous discussion at both the keynote and the following reception at Tulane’s Newcomb Garden. The business luncheon was another opportunity for socializing and a little SESAH business. One highlight is always the Best of the South Award which went this year to the Johnny Cash Boyhood Home in Dyess, AR. The committee also presented a special commendation to the Ponce City Market in Atlanta. The publications committee awarded the essay prize to Louis P. Nelson’s “The Falmouth House and Store: The Special Landscapes of Caribbean Commerce in the Eighteenth Century,” included in Building the British Atlantic: Spaces, Places and Material Culture, 1600-1850 (University of North Carolina Press, 2016). The Journal Article award went to Dana E. Byrd of Bowdoin College for “Motive Power: Fans, Punkahs and Fly Brushes in the Antebellum South,” published in Buildings and Landscapes: Journal of the Vernacular Architecture Forum (Spring 2016). The Book Award went to Kenneth Hafertepe of Baylor University for The Material Culture of German Texans (Texas A&M Press, 2016). The committee recommended that an award for guide books be added, and the SESAH board approved this new award. SESAH’s financial status is strong. Treasurer Gavin Townsend reported that, once all the expenses for the New Orleans meeting are paid, the organization should have assets of $120,000. Based on that good health, the membership approved a five year program for graduate student fellowships. We agreed to fund up to $1000 for a graduate student to attend the annual SAH meeting. SAH will waive the registration fee for our award winners, so this award will cover travel expenses. We also approved an annual $1000 research fellowship for graduate students. In order to fund these initiatives, SESAH members will begin seeing a few new check boxes on their annual renewals, allowing us to donate extra funds to these fellowships. 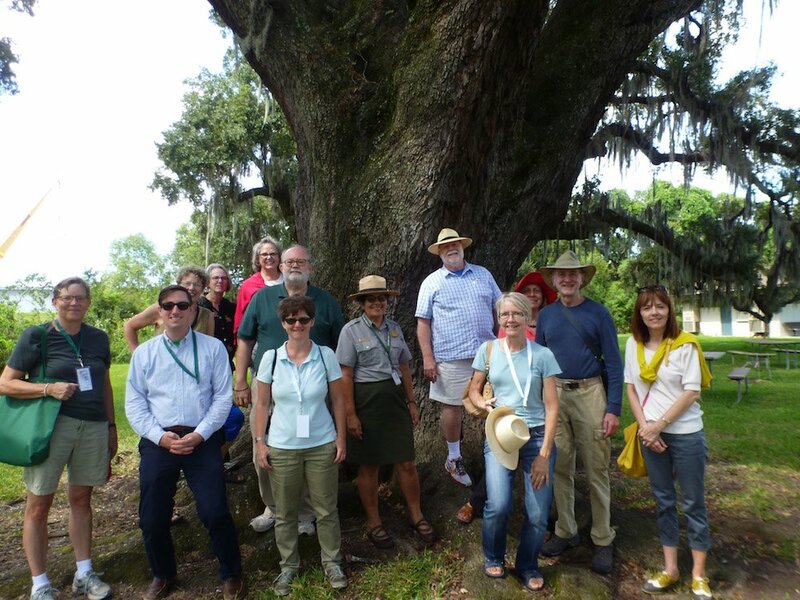 Saturday tours went forth to the plantation country, St. Bernard Parish, the French Quarter and across the city to view Louisiana Modernism. My problem was that I wanted to go on every one of them, but I had to choose, so I went on the all-day trip Downriver New Orleans and St. Bernard Parish Tour (aka Da Parish), led by Gerald McNeill. We had a great time on our almost-full bus getting to know new attendees and even had a nice break in mid-morning at the St. Roch Market, where we enjoyed a range of treats from oysters to ice cream and coffee. It was nice to re-visit old friends like St. Louis Cemetery No. 1, the Pitot House, and the Pilot houses, but this was also an opportunity to see first-hand a number of much-published post-Katrina rebuilding projects in the Ninth Ward, including the Make It Right Houses and the Holy Cross Project by the Global Green Initiative. We also spent time at the Chalmette National Historical Park, the site of the 1815 Battle of New Orleans and a restored antebellum plantation house. The highlight of the day was our lunch at Rocky and Carlos, a St. Bernard Parish institution serving Creole-Italian food in quantities described as “ginormous,” where Gerald regaled us with stories of his childhood and we took group portraits in front of the “Ladies Invited” sign. Thanks again to Gerald and Laura for inviting us to New Orleans and all their hard work over the last couple of years getting ready for this get-together of friends from around the region and the rest of the country. Conference planning is HARD WORK, and they deserve the credit for how smoothly everything worked out. See y’all in Lynchburg next year, October 11-14, 2017!